Primary synovial chondromatosis (PSC) is an uncommon benign disease process of unknown etiology in which the synovium undergoes metaplasia, leading to cartilaginous nodules that progressively undergo detachment, mineralization, and even ossification forming loose bodies. It is usually a monoarticular disease with involvement of large joints with knee being the most common. Involvement of smaller joints such as distal radioulnar, tibiofibular, metacarpophalangeal, and metatarsophalangeal joint has also been reported. This disease process is usually intra-articular. Involvement of extra-articular tissues such as bursae and tendon sheaths is rare, and combination of intra- and extra-articular diseases described here is an extremely rare condition. Herewith, we report a male patient with PSC of left knee with involvement of suprapatellar bursa who presented with recurrent knee swelling and pain with diagnostic delay of 2 years. We have also highlighted the role of imaging in the early diagnosis of this disease and briefly reviewed relevant literature. Primary synovial chondromatosis (PSC) is a synovial proliferative disease of unknown etiology as a result of osteocartilaginous metaplasia of the synovial epithelium leading to formation of cartilaginous nodules or loose bodies within joints, bursae, or tendon sheaths. It occurs twice as frequently in men than women and presents with decreased range of motion, palpable swelling, effusion, crepitus, and locking of joints. It most commonly affects the knee joint followed by the elbow, shoulder, and hip joints. The disease is usually intra-articular and extra-articular form involving bursae and tendinous sheath, and surrounding soft tissues are rare. The combined intra- and extra-articular form is very rare as in our case. We report a case of combined intra- and extra-articular PSC of knee with predominant involvement of suprapatellar bursa. A 20-year-old male presented with progressive left knee pain for about 2 years. Initially, there was mild pain with no swelling and restriction of movements. The local doctor started him on oral analgesic after the knee X-ray was negative. There was a history of trivial trauma before patient's symptoms. The patient responded to the analgesics to only present after a few months with knee swelling and decreased the range of movement. The knee radiograph done at this stage showed periarticular soft tissue density in suprapatellar recess suggestive of effusion. An erroneous diagnosis of reactive arthritis was made considering history of fever and raised inflammatory markers, and the patient was started on antibiotics. The patient was asymptomatic for few months to subsequently presenting to us with progressive knee pain and swelling with crepitus and reduced range of motion. On general examination, the patient was afebrile. On palpation, there was suprapatellar fullness with crepitus and diffuse tenderness all around the knee. There was no local rise of temperature. 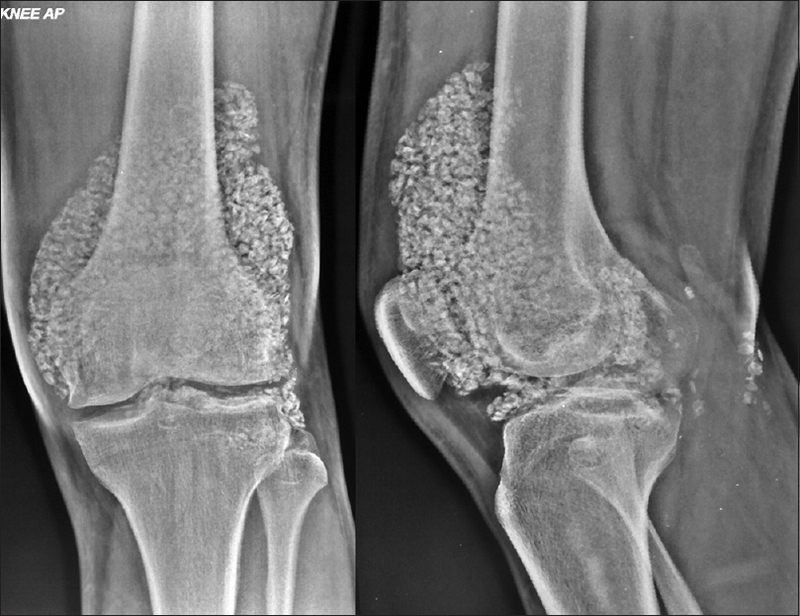 Knee radiograph showed numerous calcific nodules of uniform size in suprapatellar bursa and intra-articular location with subtle degenerative changes of joint [Figure 1]. 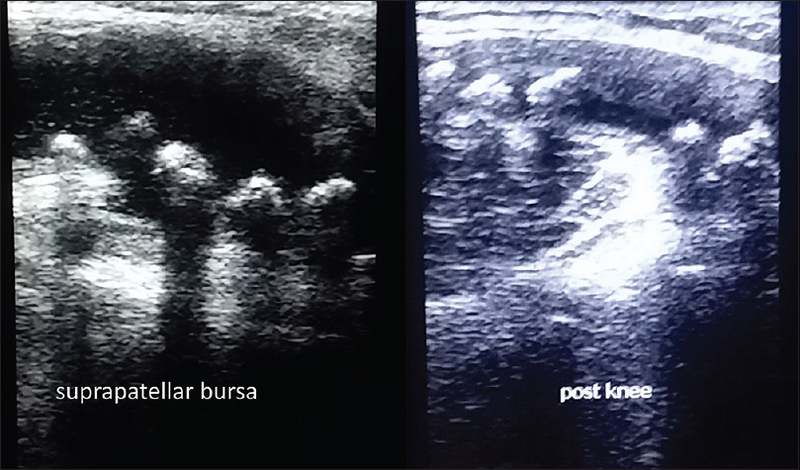 Ultrasonography of knee demonstrated hypoechoic soft-tissue lesion with multiple calcific nodules in suprapatellar bursa and joint cavity causing posterior acoustic shadowing [Figure 2]. Plain computed tomography (CT) scan of bilateral knees was performed and showed multiple small, rounded well-corticated bodies with relatively hypodense centers suggestive of fatty marrow in suprapatellar bursa as well as in intra-articular location, extending to posterior joint cavity in the left knee [Figure 3]. Volume-rendered three-dimensional CT reconstruction of bilateral knees showed fullness in the left knee, predominantly in the suprapatellar region [Figure 4]a and nicely depicted the extension of loose bodies [Figure 4]b. The patient was treated with open surgical excision with synovectomy and removal of loose bodies. Histopathological examination of loose bodies permitted definite diagnosis of synovial osteochondromatosis by showing mature chondrocyte and mature bone with fatty marrow. PSC is an idiopathic disease characterized by synovial nodules in young male adults. In contrary to the above, secondary type affects relatively older patients with degenerative arthropathy having loose bodies separated from articular cartilage. However, in more advanced untreated disease, the presence of intra-articular bodies in PSC will eventually lead to secondary osteoarthritis. Depending on histological and radiographic features, Milgram et al. described the disease in three temporal phases. In Phase I, active synovitis and metaplasia of the synovial intima occur leading to nodule formation, but no calcifications occur at this stage. In Phase II, there is the formation of loose bodies within the joint which are primarily cartilaginous with nodular synovitis still persisting. In Phase III, synovitis comes to an end, and loose bodies have a tendency to unite and calcify. Diagnosis of synovial chondromatosis is often made following a thorough history, physical examination, and radiographic examination. Characteristically, radiographs show evenly distributed innumerable intra-articular calcifications of similar shape and texture throughout the joint space. Typical “dot-and-comma/ring-and-arc,” “popcorn-like” pattern of mineralization is common signifying chondroid origin. As the disease progresses, initial formed fragments of chondroid nodules undergo further endochondral ossification to form loose bodies. Similar to intra-articular disease, tenosynovial and bursal chondromatosis demonstrate calcification in most of the cases which occurs as per its anatomical location. On ultrasonography, synovial chondromatosis shows heterogeneous mass containing foci of hyperechogenicity with or without posterior acoustic shadowing depending on the mineralization or endochondral bone formation. CT is the optimal imaging modality for detection and characterization of calcification and extrinsic erosion of bone. Kramer et al. described three subtypes (A, B, C) based on the magnetic resonance imaging (MRI) signal on the extent of mineralization and ossification of the chondral bodies which roughly correlate with Milgram 1, 2, and 3 pathological subtypes, respectively. Subtype A (unmineralized lesions) shows low/intermediate signal intensity on T1-weighted MRI and high-signal intensity on T2-weighted MRI, features mimicking synovial fluid/mass, an easy-to-miss the lesion. Nodules with intact vascular stalk show peripheral enhancement on T1-weighted gadolinium-enhanced MRI differentiating joint effusion or synovial fluid from nodule. Pigmented villonodular synovitis is a close differential in which radiography may show signs of joint effusion or appear normal similar to early stage of PSC, but MRI shows lobulated mass lesion with low-signal intensity due to hemosiderin, and short TI inversion recovery shows predominantly high-signal intensity. Subtype B is similar to pattern A but with additional foci of signal voids due to the presence of calcification. Subtype C shows foci of peripheral hypointensity and central fat signal intensity secondary to ossifications and central fat shows signal suppression on fat saturation sequences., History of multiple recurrences along with MRI features of cortical destruction with invasion and permeation of bone marrow suggests malignant transformation to synovial chondrosarcoma. On long run in untreated patients, osteoarthritic changes and mechanical destruction of cartilage by the loose bodies lead to immobilization of the joint. Synovectomy and removal of the osteochondral bodies (either by open or arthroscopic surgical excision) are the treatment of choice. The presence of extra-articular disease precludes arthroscopic excision. Local recurrences are effectively treated with surgical re-excision., Hence, recognizing the radiological imaging patterns of PSC, which reflect their underlying pathologic characteristics, is important to optimize patient management. Delayed diagnosis in our case can be attributed to low suspicion in early stage of disease presentation where radiographs are noncontributory and erroneous diagnosis of trauma and reactive arthritis by the local physician. Contrast MRI could have helped in early diagnosis of the disease and surgical planning. Murphey MD, Vidal JA, Fanburg-Smith JC, Gajewski DA. 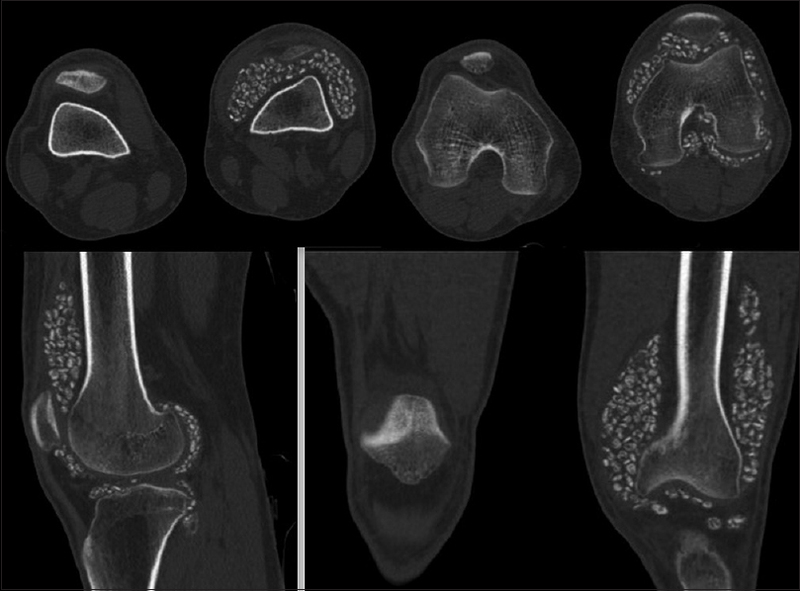 Imaging of synovial chondromatosis with radiologic-pathologic correlation. Radiographics 2007;27:1465-88. Crotty JM, Monu JU, Pope TL Jr. Synovial osteochondromatosis. Radiol Clin North Am 1996;34:327-42, xi. Bassir RA, Ismael F, Elbardouni A, Mahfoud M, Berrada MS, Elyaacoubi M, et al. Bilateral synovial chondromatosis in the knee joint with both intra and extra-articular diseases. Pan Afr Med J 2014;19:57. McKenzie G, Raby N, Ritchie D. A pictorial review of primary synovial osteochondromatosis. Eur Radiol 2008;18:2662-9. Alkubaidan FO, Heffernan EJ, Munk PL. Extra-articular synovial chondromatosis in a prepatellar bursa. Eur J Radiol Extra 2007;63:17-20. Wittkop B, Davies AM, Mangham DC. Primary synovial chondromatosis and synovial chondrosarcoma: A pictorial review. Eur Radiol 2002;12:2112-9. Fetsch JF, Vinh TN, Remotti F, Walker EA, Murphey MD, Sweet DE, et al. Tenosynovial (extraarticular) chondromatosis: An analysis of 37 cases of an underrecognized clinicopathologic entity with a strong predilection for the hands and feet and a high local recurrence rate. Am J Surg Pathol 2003;27:1260-8. Kramer J, Recht M, Deely DM, Schweitzer M, Pathria MN, Gentili A, et al. MR appearance of idiopathic synovial osteochondromatosis. J Comput Assist Tomogr 1993;17:772-6. Go T, Aoki H, Ikata S, Miyazaki Y, Hasegawa K, Nakamura T, et al. A case report of synovial osteochondromatosis of the knee joint with neither calcification nor a synovial lesion on imaging. Open J Orthop 2016;6:351.